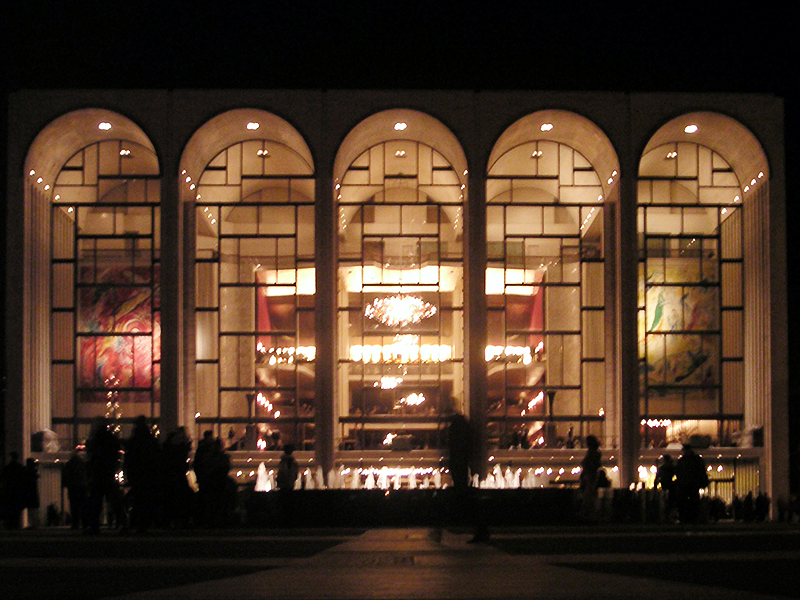 The Metropolitan Opera house at Lincoln Center is an iconic New York City landmark. Yet, only a small percent of tourists to the City (or even residents) wind up visiting. Decent seats can be had at the Met for far less than Broadway shows and other diversions, sometimes even on the day of the performance! Day of performance discounted opera tickets are NOT available at the TDF/ TKTS booth, so that’s one tourist-friendly option that’s out. But many full-priced seats at the opera cost less than the half-price tickets available for long-running Broadway musicals. Plus most performances offer the opportunity to purchase FABULOUS rush-tickets for only $25 each. My aim here is to give would-be opera goers and visitors to the city an easy guide to getting inexpensive and/or last minute seats at the Met. What does the Met mean by “Single Tickets”? The term “single tickets” refers to tickets that you aren’t buying with any kind of subscription, and that you may buy if you don’t have a subscription. It sounds confusing. They should probably call them “non-subscription tickets” or “public tickets.” Of course you can buy more than one “single” ticket or tickets for however many operas you want to see! If you are planning a visit to New York during the opera season (mid-September thru mid-May) and wish to get tickets in advance, you can do so from anywhere in the world, online! You do not need to go to a ticket broker as the Met offers the best deals on its own tickets, and while the better less expensive seats may sell out quickly for the more popular operas, there are usually decent seats in most sections at the box office – even at the last minute. Full price tickets start as low as $27. HOWEVER, the Met doesn’t start selling tickets until sometime in the summer. When the new season is announced in the spring, they sell various types of season subscriptions first, and offer subscribers a chance to buy tickets to additional operas. They won’t offer the non-subscribing public the chance to get “single” tickets until some time in the summer. SO if you are planning a trip for October in May and go to the Met site, you won’t see a way other than subscription to buy tickets for the coming season. Don’t panic! Don’t go to a ticket broker! Just wait. Keep checking the Met Opera site for updates. “Single tickets” usually go on sale in late June or early July. Nothing sells out that quickly, and there will be plenty of available “non-subscription” seats. Remember: NOBODY except subscribers can get them earlier! Years ago the Met had a rush ticket program for deeply discounted “day of” performance tickets that required waiting on a physical line at the box office. THAT’S GONE. They also had a special rush ticket lottery for seniors. THAT’S GONE. (There are NO special discounts for senior citizens.) They tried to replace the rush line with a lottery for all rush tickets, but that didn’t last long either. Currently, rush tickets are sold online only on a first come first serve basis. Tickets cost $25. Unlike all the other tickets sold, there are no facility or administrative fees. You will only be charged $25. There is a limit of 2 tickets to a customer. For performances Monday thru Friday night RUSH tickets go on sale at noon. Here is the link to the Met’s general information regarding the program. They go on sale four hours before the matinee for Saturday’s early show, and beginning at 2 pm for Saturday’s evening performance. The seats are generally in the rear of the orchestra section. Most are under the overhang, which some people feel muddles the sound as compared to other sections. Most are not in the center. However, these are still very good full view seats. To buy the Met Rush tickets: First make sure to register at the Met Opera site . Then log on before you attempt to buy your tickets. On Monday thru Thursdays, after the stroke of 12:00 noon, the magic link to buy rush tickets will appear on this page. After the stroke of 12:00 noon, a link will appear on that page to “buy rush tickets”. If you get to the page before noon, you might need to click refresh at noon for it to come up. As soon as it’s up, click the buy button. You can choose to buy one or two tickets using your credit card. You may get a message that the tickets are all in other customers’ carts. This means you are probably out of luck or that there are no more chances for 2 tickets, but you might be able to get a single ticket. The seats are randomly selected. You cannot choose your own seats for RUSH. EXTREMELY IMPORTANT UPDATE (1/8/16) The Met has added a “captcha” to its Rush ticket page. While this is probably a good thing in terms of preventing these tickets getting into the wrong hands (resellers hands), it may gum up the works for consumers. When I first encountered it, I tried refreshing the page and answering the captcha question at 11:59. When the buy tickets link appeared, I still had to enter it again. By the time I got to the link tickets were SOLD OUT. Usually, you’ll get that they are all in other people’s carts, and/or it might still be possible to get single tickets. In this case they were SOLD OUT by 12:02. Granted that was on a Friday when they have a fewer rush seats AND it’s a popular opera, but I can’t say at this point how much the captcha will change things. I’ll be experimenting to see and will share any tips. Meantime, if any readers have comments about the new captcha, please chime in below. (1) There will be more tickets available on week nights than on weekends — a minimum of 100 Monday thru Thursday. A minimum of 20 for Friday and Saturday. So if you are hellbent on going on the weekend, you might consider other options. (3) Sometimes with more popular operas the rush seats go IMMEDIATELY. Other times they sell more slowly. Your best bet is to be ready to “click” at noon, but if you are reading this blog later in the day and still don’t have plans, you might check it out. Sometimes you’ll get lucky. (4) Most people are buying two tickets. You may have a better chance if you are buying a single ticket. (5) IMPORTANT: If you succeed in buying your tickets, you won’t be able to order through RUSH again for one week under your registration. So you might want to strategize if you are planning to see more than one opera during a short stay. There are other options for cheap seats discussed in this post, but RUSH is by far the best and now the easiest deal. If you don’t succeed in getting your tickets, you can try again another night, or look at as some other inexpensive options listed in this post. You must be a full-time graduate or undergraduate student in a degree program to qualify, and you need to REGISTER to be eligible. There are details about the program available on the Met site here. The basics: Standing room tickets go on sale at 10:00 am on day of performance. (I’ll have info on buying at the end of this section.) Standing room for the orchestra can run to $40 for “gala” events (the opening night of an opera). They are $35 weekends and $25 during the week. At least that’s what it says on the Met’s website. HOWEVER, I recently found they were charging $30 for a “regular” weeknight performance of Il Trovatore, so it looks like prices may have gone up or are flexible. The price does not include the previously mentioned “administrative “and “facility” fees so add $10 to all those prices. That’s right! Your $30 standing room ticket will cost $40. Those fees definitely make standing room a less attractive option than Rush! Family Circle standing room is available for $20 on the day of the performance — but only if the Family Circle is sold out. The following is a description of the standing room options, as well as instructions on buying your seats. Orchestra Standing Room — The Experience: My problem with orchestra standing room is not the standing. Most people can stand comfortably for that amount of time, and there are intermissions when you can stretch your legs and get out the kinks. You can also lean against the bar in front of you. However, seeing from standing room is a real issue. You don’t simply stand in the back of the orchestra section. You are assigned a place number. There are three rows. Each row has a bar with super-title viewers. Each “place” has a viewer. They are spaced very closely together. There are no platforms of any kind, so if you are not in the first row, and the person in front of you is taller than you are, there is a good chance you will see nothing. And by nothing, I mean nothing. Personally, I would NOT buy a standing room ticket unless I had a “first row” place. The site line from the first row of standing room is similar to being in the rear of the orchestra. The sound is also similar – that is it may be less clear under the overhang than in front of it. Also the overhang cuts out the top of the stage, and from a standing angle you might not be able to see it. Some productions use different levels including the top of the stage, so for those productions, the standing room view may be slightly obstructed. However, as a “last minute” “inexpensive” option, orchestra standing room, particularly if you can get the front row, is a reasonable choice. Family circle standing room only has one row, so you don’t have to worry about people in front of you. Tickets are only $20 (plus administrative and facility fees so it’s really $30) You’ll get a full but very distant view (bring binoculars) with great sound. Two caveats: (1) These places are only available if the Family Circle is sold out. (2) The wooden bar you stand behind is somewhat high. If you are under five foot five inches in heels, then you are going to have trouble seeing. So if you are vertically challenged, wear your highest heels and/or take a small footstool, and hope they let you use it. On the plus side, I’ve heard if people don’t show up, the ushers will let you sit in empty family circle seats whereas in the Orchestra standing room, they will most definitely NOT. Buying Standing Room Tickets – You can go buy standing room tickets at the box office after 10:00 am, or by phone, but the easiest way is to buy online. To buy standing room tickets online, first you need to go to the Met site and REGISTER or log-on. Go to the link to buy tickets for that evening’s performance. (Click the “tickets and info” button for the opera.) You should see a drawing of the different sections. Click orchestra or family circle depending on where you want to stand. The standing room places are the ones past the labeled rows. (Behind orchestra “EE”.) Select the “places” you want as quickly as possible.. CAVEAT: For Saturday matinees you can’t purchase standing room online, only by phone or at the box office. Why would you choose Standing Room over Rush? Rush tickets are generally a better option than standing room. You can sit down AND they cost less. However, if the production is particularly popular, and it’s too late to get good or reasonably priced tickets, it might make more sense to get FRONT row standing room as soon as you can (10AM) rather than wait till 12 and take a chance on Rush. If you don’t succeed in getting your Rush tickets, you might find it’s too late to get standing room or that front row standing room is sold out. This is especially true for two people going together. Getting Rush tickets with the current system can be a matter of luck if the show is popular, so if it’s your last night in town or last chance to see a particular performer, I’d recommend getting a front row place in standing room. Another factor to consider if you are in town for a limited time: You can only “win” rush tickets one night in seven, so if you want to see more than one production in a short time, you might wind up using both standing room AND rush. CAVEAT: The first row of the Family Circle should be avoided. The barrier in front of the row is high and cuts off a good part of the stage for anyone under six feet tall. You can see fine if you lean a few inches or sit forward, but this is not so great for the back — or the people seated behind you. I’ve sat in the second row and further back and haven’t had this problem. Also AVOID the two seats closest to the aisle in the first and second rows of Family Circle. There are steps leading to the family circle section from the main balcony. A support beam for the railing obstructs the view from the two seats closest to the aisle, especially the aisle seat. Full-view balcony seats run from about $80 to $120 so they aren’t all that “cheap.” (Partial view side seats are less.) But they are very reasonable for what you get, and cheaper than most “half-priced” balcony seats for Broadway musicals. Honestly, the sound will be better than if you are seated in the back of the orchestra where the seats will cost a bit more, and the view will allow you to see the entire stage and the orchestra. Lately, the Met’s online system has been offering $10 a ticket “upgrades” to the rear orchestra when you try to buy balcony seats. Don’t take them! A good balcony seat beats the rear orchestra in terms of sight AND sound. You are better off buying your tickets online at the Met’s site or directly at the box office rather than using any ticket broker or ticket site. There are often seats available even on the day of the performance and the sight lines at the Met are very good even for the less expensive seats. If you are planning to buy from a non-Met website, or on the street, you should check the Met seating chart before you buy, and be aware that if the tickets you buy are no good, the Met will not help you in any way. There will often be people trying to unload tickets near Lincoln Center right before the opera. Beware. They may be offering you a good deal or a rip off. There is no way to know and nothing you can do if you get scammed. Even if your trip is a last minute one, chances are there will still some decent seats left a few weeks in advance or even the day of the opera. The better seats within each section will probably be gone, and the best bargains in the balcony and family circle sections may be sold out, but there are still alternatives. The site lines are great throughout the house, and the Met online system previews the stage view from your seat – warning you if it’s an obstructed view. There isn’t one at the Met, but people have asked, so let me address it. Some people, even in the cheapest seats, dress up. Others, even in the most expensive seats, don’t. Shorts and a tee-shirt won’t get you pegged for a tourist, and this being New York probably won’t raise any eye-brows. You really can’t be “overdressed,” but if you are casually dressed no one will care. Please note: Comments and questions are welcome, but I’ve deleted some old comments that referred to previous iterations of the system and might be confusing. Feel free to leave comments about your own “cheap” ticket buying experiences at the Met, or questions. If you’d like to thank me for posting this useful information, nothing says thank you like buying someone’s book on Amazon and leaving a glowing review! Do the same rules appliy for ballet tickets? As far as I know, the rush tix are a program of the Metropolitan Opera and NOT the American Ballet Theater. I’d recommend you check the ABT website as their might be something, but I don’t know what it is. Given that a lot of Broadway shows have some form of “rush” tickets, I would be surprised if there wasn’t something. How are the orchestra seats in Section C, rows Y-EE? I am coming from New Orleans in September and want to buy now. Cannot figure how to buy from the Met. Only see all these other sites. Any help is appreciated. Edited and updated reply: Here is a link to a seating chart: http://www.metopera.org/upload.....%20pdf.pdf. This comment was sent when the Met still had a physical line for rush tickets and scalpers would buy the tickets and sell them for high prices. See the paragraph above regarding “Buying in Advance.” My best advice is check in at the Met website to find out when “single tickets” go on sale and make your selection. You’ll have to register at the site, but you can do everything on line and see exactly where your seats will be. Wanted to take the time and say this post is a wealth of great info on the Met and PLEASE don’t delete it, you’ve done a fantastic job and there will be others who will gain from your knowledge. I was wondering… I know there is no dress code enforced but can a visitor go to the met with jeans and a casual shirt and not get weird looks? I’m traveling light and I’m not about to pack my best suit cause I’m going to one session of opera. Thoughts? Thanks, Joe. I am updating this site frequently (and these responses) so I hope people won’t be too confused! Regarding your question: There is no dress code. It’s kind of anything goes. A lot of people do dress up, and a lot of people wear what might be described as “office appropriate.” There are enough people in jeans and casual shirts that you won’t get looks. I would NOT pack a suit just for the opera. I have observed at least one regular (I’ve seen him more than once) who often wears shorts and a tee-shirt, and kind of resemblance the comic store guy from the Simpsons. Also this is New York — we are very tolerant. Thanks for all the info. Can you explain a little more of what the Rush Lottery thing is? Also, my main question, does one avoid the exorbitant ticket service fees for regular tickets if one buys from the physical box office instead of online? UPDATED: Per the post above, the Met no longer has a lottery. Marion, thanks so much for this guide. When the link to buy tickets is published, are you able to select specific seats, or do you simply put in for the number of tickets you want, and you get what you get? There is no choice of which seats, but you do see which seats have been selected for you before you press buy, so you could always just say no. But you will not get to choose other seats within rush. All of the rush seats seem to be in the rear orchestra, and they have a minimum of 100 seats available on Monday thru Thursdays. I believe they add more seats if they have a lot of orchestra seats available as a couple of times I’ve gotten seats that don’t always seem blocked off, and were a little better than usual (row U for example). On the other hand, I’ve also sat in the very last row (EE) of the orchestra. Well, I will be thrilled with any one, anywhere in the house, so thank you, that’s a big help to know what to expect. Not to start a correspondence, but what do you mean by “blocked off?” The performance I’m looking at seems to have mostly scattered seats, the only potential larger blocks seem to be on some of the balconies. My theory (and this is unconfirmed): If you go to the “buy tickets” link for any opera, the seats that are reserved for rush don’t come up as available. You can only buy them as “rush” tickets. That’s what I meant by “blocked off.” I think since they lowered the minimum number offered to 100 on Monday thru Thursdays, they also may add more seats to rush when there are a lot of empty seats available — those times when I wound up seating in row U or V for instance. I don’t think those seats and rows are always in the rush mix. Aha, that makes sense, and good to know there could be additional seats released with the block. I’m going to guess those rare U and V tickets go first? Fingers crossed, and excited! I’m not so sure if the better seats go first. It may be randomized. But none of the rush seats are bad. Some are just better than others. Aha, that makes sense, good to know that loners might get lumped into the block. Fingers crossed, and excited! I am a visitor from the UK and would like to buy cheaper tickets for Carmen this Monday or Thursday. See all the cheaper tickets are sold out. 1) Is there a chance that cheap tickets can come online before Monday or Thursday (i.e. returned tickets). 2) How early in the morning should one line up outside the Met in order to have a good chance of buying a standing ticket on the day of the opera? (Is it better to try buying it online or by phone on the morning of the opera)? Sorry, I didn’t see this till now. I hope you got your tickets! If not think these questions are answered in my blog. As I write this it looks like RUSH tickets are still available for tonight’s performance, so I hope you tried that! If not and you’re planning for Thursday, please review the above post. I’d recommend REGISTERING for the Met first so you can do your online shopping. The odds of getting rush tickets are very good, so you might want to wait till 12:00 noon on Thursday and try then. OR you could get standing room as early as 10:00 am. Re tonight: I don’t know how they handle “returned” or cancelled tickets at the box office. It does look like there is also standing room in the front row of orchestra standing room, so that’s another possibility for tonight if you can’t get the Rush. Just a quick note to say thanks for this post! I sat in row U for Carmen last week and it was enthralling. This post is epic. It’s a great guide on how to get last minute tickets. This is a great post. I was wondering about ways to avoid that service charge but I think there is no escape. That’s how I got here. There is so much useful information in here even for seasoned people. If you get 2 ‘Rush Tickets’ will they be side by side seats? Yes. The seats will be next to each other.